I have been a full time potter now for about 3 years and while I have had some friends donate shipping materials to me, I have found that I have not had to purchase these materials. First, I can’t imagine doing that because I just don’t have the funds for it and second, there are items in all of our houses that will cushion fragile items without spending pennies on that kind of thing. I thought it would be helpful to other potters to showcase the way that I ship an item, or more to the point, what I use to ship an item. If your house is like mine, there is lots of junk mail that gets delivered to your house every day. What do you do with it? Do you recycle it? Do you just pitch it and it ends up in the landfill, ultimately causing your county taxes to rise? Do you compost it? My solution to packing material is to shred the junk mail and store it for packing. 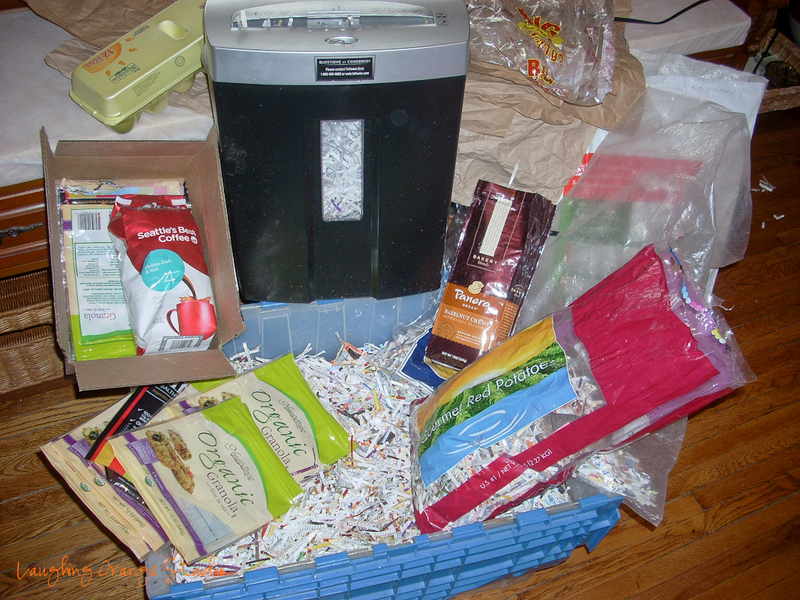 I bought a small shredder at Target for about $40 and each day, or when the pile gets too large, I shred it and store it as packing materials. If you don’t have a need to ship something to use it in this way, you could also compost it. Many printers now use a soy based ink that would be fine in the compost pile and it can line planter boxes to use as a mulch. You could cover it with a wood mulch so that it doesn’t blow away but, I have used it as a weed barrier in my cold frames. Plastic bags are something that I have eliminated from my local grocery store but that doesn’t mean that other food substances don’t make it into my house in some kind of plastic bag. Think apples, potatoes, onion, oranges, granola, coffee, the list can go on and on. So, I reuse those bags and stuff the shredded paper into those and they work just like those air filled bubble pillows that sometimes come in a package. My paper stuffed bags may be a bit heavier than the air filled pillows when I have to figure the cost of the package but that cost is offset with not having to purchase a shipping product. And wrapping paper. I have a great source for my wrapping paper. My old employer just so happens to toss a wonderful brown and white paper and I occasionally can connect with them and pick up a large batch of this to have a substance to wrap a package with. My clay boxes are great to ship in so those get used a lot to send out wares. There always seems to be boxes here as well so I have not reached a point in three years that there has not been a box somewhere in my house that I can ship an item, both large and small. There might come a time that I might consider purchasing some nice gift boxes but so far there has not been a need for that either. Make do with what you have is always been my motto, as many of you know. Clay comes in a really heavy plastic bag and if you go through a lot of clay, as I do, you have lots of those bags lying around the studio. I will take those bags and run them through the washing machine. As the washer is filling up, I catch some of the water in each bag so that they get good and wet and then I hang them up to dry and they make awesome packing material or transporting wares inside the shredded paper. I will admit that the only item that I have purchased for my wares has been “orange bags”. I found an online source to purchase a net bag that looks like an orange bag as a branding tool given that my company name is Laughing Orange. I promote the bags at shows by hanging them from my tent and give each customer my speech about the importance of recycling, explaining the shredded paper in the bag and ask them to use the bag at the market for their produce and to reuse the bag. Because the bags are red, they draw customers in and they are curious about what their purpose is. Tape is the only material that I am having to purchase at this time and I wish I could find an alternative to that but I don’t see that happening for a while. So, if you are a fellow potter and are curious about how you can use what you have to pack your wares or are just looking for ways to avoid having excess junk mail in your house, I hope you find these tips helpful when you are packing or shipping a box of something to someone else.